Thanks Jay, could you email me Scotts phone # to mark@liteindustries.ca please. We have access to quite a few extrusions but that one does not make the truck look like a horse trailer. Here is a shot of my truck, a nice clean low mileage 1995 F-700 crew cab 4x4. I'm just collecting parts now and have a 2 year timeline to build. You just might see a few Eco-roamer idea hijacks here and there but you have obviously put a lot of thought into your project and it shows. Oh yeah, funny thing is the truck came from New Jersey. Looks like you've got a great truck to start with. I'd definitely love to hear more about what your plans are and see if we can make some suggestions. 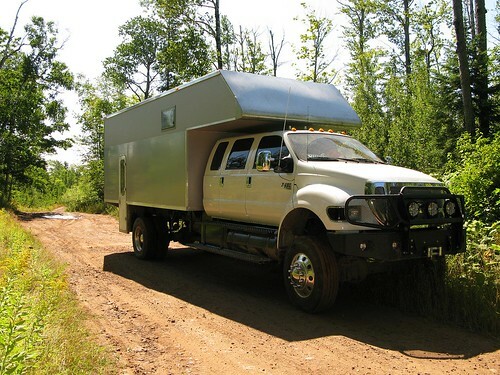 The EcoRoamer is being built as an Open-Source Project under our Muskoka Foundation, so as long as you promise to do some good with your vehicle once you get it built, then you're welcome to 'steal' any ideas you like from it. I will be posting the actual CAD files and vendor lists, etc. to our website at: www.EcoRoamer.com as they come available. PS - Checked out your LITE vehicles. Now those are some serious tires/wheels. Hmmm... maybe I should rethink my 20 inchers! Forgive me for not reading the previous 27 pages, but where did you buy the truck? 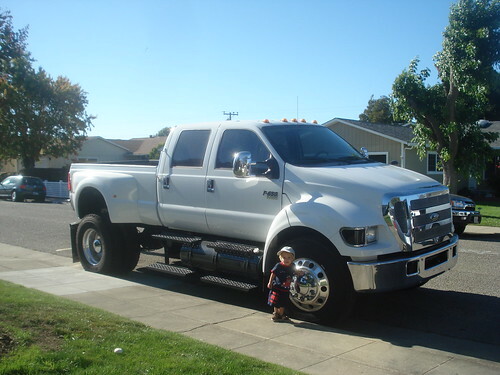 I bought the truck originally as an F-650 Pick-Up truck over the internet from a guy out east who was using it as a show-truck for his Custom Choppers business. It seems the business wasn't doing so well, and so I was able to pick-up this 1yr old truck with less than 7,000 miles on it and $30,000+ less than he bought it new! If you're willing to have a more utilitarian interior, there's even better deals to be had by buying a used moving/landscaping truck with a crew cab. arriving in the middle of the night. Kurt likes Dadda's new truck. The rule is: He's allowed to drive it when he can reach the pedals. still not done yet, but we're getting there! PS - I like your Frontier build. If you've got the time, I'd highly recommend Layne Wright at Denver Offroad Bumpers, he makes AMAZING custom front/rear bumpers out of aluminum and can build anything you want. I had a great experience designing / building mine with him. PM me for his contact details if you want. 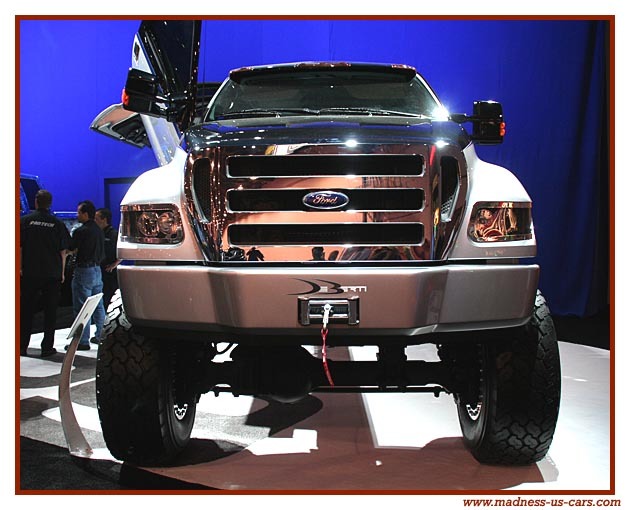 I may take you up on the bumper fabrication contact in the future, as there are few (and poor) options for my truck. 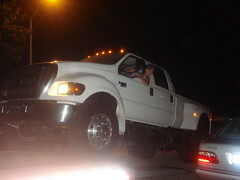 Love your truck and hope to have one someday. I suspect ExPo member ScottyMizt worked on that one! Anyone out there in Indianapolis, or that area? I've just spent the last 2 days getting paid to read your build while I have been at work, but not actually working. Anyways, as others have mentioned, it's a fantastic, impressive and visionary build. Kudos for the leap you have taken with the great personal expense you have endured, your willingness to share with us all, and also the great experiences you will give your children on your journeys. How old are your kids, and do you have any concerns with travelling for such an extended (think you mentioned 2 years???) period of time with them? What areas of the world are you planning on travelling to/through on your journey? And I wish I had been around ExPo when you first posted about buying wheels from Daniel @ USA6x6 -- I would have VERY strenuously and probably not in polite language, help to sway your mind to avoid that douchebag at all costs!!! I hope you are able to find a good solution to this wheel/tire issue! The bottom step has the greatest depth and I thought maybe put a drawer or slide in there to make it easy to reach the pair of shoes at the very back of that compartment? 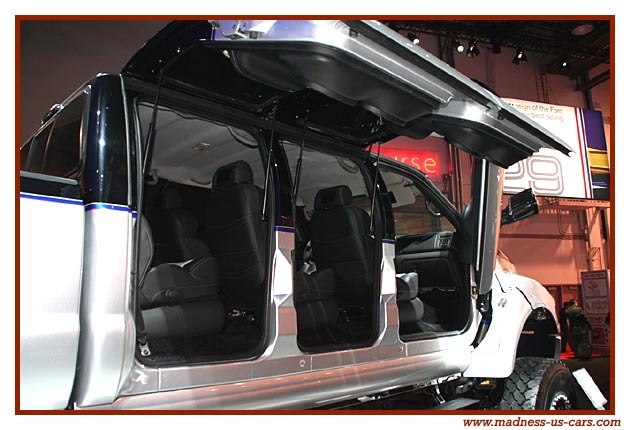 From everything you have said about it, the big "door" will only fold to a horizontal position. I was looking at that and thought maybe you might like to have it lower all the way to the ground for loading purposes? It might be a better option over loading everything through the man door on the side? I have no idea how steep the ramp would be if it lowered to the ground, but there could be a fold-out extension built to help reduce the steepness of the ramp? That was a very unique way of mounting the spare tires and the manner of getting them to the ground. 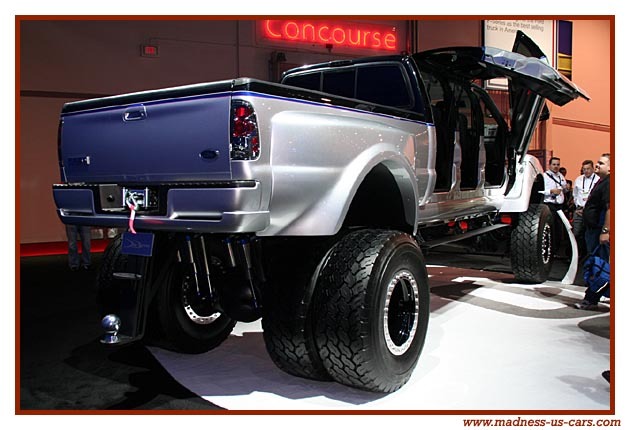 Are you able to lower the tires without having to drop the rear ramp? Thank you so much to everyone on ExPo for all of your interest and support over the past (almost) two years. This is by far the best community on the web, made up of amazingly generous & passionate people. Thanks. When we first decided to make the EcoRoamer an 'open-source project' by and for the community I had no idea of the kind of response it would generate. 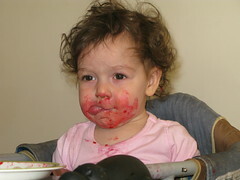 But the suggestions, advice & warnings have been so helpful. Even the debates have really caused a lot of people (us included!) to think through some really tough questions and issues. I can't wait! Talk to you all soon. Just finished reading the whole thread. Fantastic project. I love your 'open-source' approach to this project. Thanks, I've taken a lot of notes. We started a CAD Library on our off-road website a few years ago with the same idea; it's a shame to see good ideas and designs only used once. Kurt is 3yrs old. 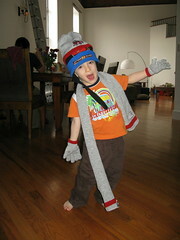 He loves "dadda's big white truck" and has been a big help 'testing' various design elements. Ha Ha!! We'll keep you in mind! Though, as a quicker solution, if you are interested in doing development work to help the communities that you visit, then you can buy your own EcoRoamer on a non-profit basis. We've decided to offer the plans / documents for free to anyone who is interested (they're posted on our site) and through our foundation (The Muskoka Foundation) we are planning on producing ready-to-roll EcoRoamers at-cost for anyone willing to help us make a difference. It's a great way to get a great vehicle, save a lot of cash compared to buying a for-profit off-the-shelf expedition vehicle, and help to make the world we live in a little bit better. Nice idea... The rear wall is actually just bolted in place, so the whole thing can be removed as one subsection, allowing easy access for the cabinets, appliances, etc. In the future if we ever have to take something out / in, then we can just pull that wall off again. I like the thought about the ramp door, but the angle would be much too steep. Once the ramp is on there I'll post some pics and you'll see what I mean. JG: Thanks for your comment. I took a look at your site, some nice projects. I read your post over on the Libby thread. Unlike Jack, I don't make my living doing this (though to be fair, I don't have nearly the experience he has) - so I'll be happy to share whatever I know. PM me with any specific questions, and I'll try to help. For those of you who have been reading this thread for a while, you may recall that this summer while we were in Canada we tried to get a second alternator installed on the CAT engine, and were told flatly that "it couldn't be done" by both CAT and a recommended alternator specialist. Well last week, the guys at Van's Electrical (www.vanselec.com) in Indianapolis somehow managed to do the 'undoable'. I had serious reservations about bringing the truck all the way to Indy (about a 4hr drive) just for an alternator, but Leon at Mobile Energy told me that he'd never seen a truck that they couldn't do. I guess he was right! Some of you may be wondering (or clicking your tongues) at our choice of going with 24v for the camper. This is one decision that I have struggled with for a long time. I'm unhappy/scared about the complexity of having 12v (in the cab) AND 24v (in the camper) AND 120v (after the inverters) all in the same vehicle. We have really tried to keep everything as simple as possible in this truck, and this definitely doesn't qualify as 'simple'. The main reasons for doing it are the advantages of 24v over 12v given the huge loads we want to put on the system. Our goal is to not have to run the generator, or at least run it as little as possible. The way to do that is through a huge battery bank and substantial solar & alternator charging capabilities. By going to 24v we can have more than 4 batteries (which start to not play nicely in 12v) by having 4 PAIRS of batteries. We also have lower current running through the wires, which eases some of the guage requirements. And... the inverters and solar charge controllers all seem to operate more efficiently at 24v than 12v. The fact is, outside of the truck cab, we are going to have very little that operates on low-voltage DC anyhow. The lighting is really the largest draw, but all the rest of the appliances are 120v AC anyhow. Do I sound like I'm justifying this to myself? One of the other struggles for months has been the idea of the Window Security film. ...and I've always thought it was a good idea for us, but couldn't find anyone who has actually installed it on their vehicle, or a dealer who knew how. In the end I contacted Llumar who claim to have an automotive security film product. They explained to me that while the product is a big seller for them in South America / South Africa (where smash-and-grabs are more common) they had sold almost zero feet of the film in the USA in the past five years. There was some obsolete 4mil film sitting on a back shelf somewhere and they offered it to me at a substantial discount. I worked with Paul's Glass in Indy to strip off my old tinting and put on the new security film. It's not easy to do since it is so thick & stiff, but they did a great job with no bubbles or slipped edges anywhere. It's nice to be able to see out of the side windows of the truck again (it had limo dark tinting before - useless!) though I keep fighting back the urge to take a brick and whack the windows just to prove they won't break... I won't. I posted this video last time, but it's worth watching if you didn't see it before. Paul's Glass also runs a stereo/car alarm shop called Mobile Concepts, so I went back the next morning to get Matt Julius there to take a look at our alarm which wasn't working. Now, I generally hate car alarms and think they're pretty useless. They are going off constantly in my neighborhood and I don't think anyone pays them any attention. 1 - The Blackjax anti-carjacking system. Essentially, you enter a pin code on the dashboard when you start the car. If you ever get carjacked, you just walk away and let the guy take the truck. He won't know to enter the pin code and will just drive away. The system then counts down for 60 seconds and then sounds the alarm and slows the engine, turning on the immobilzer when the truck has stopped. This gets them safely away from you, but within a small enough radius that you can find your vehicle again. You can watch a YouTube video of the system working, here. 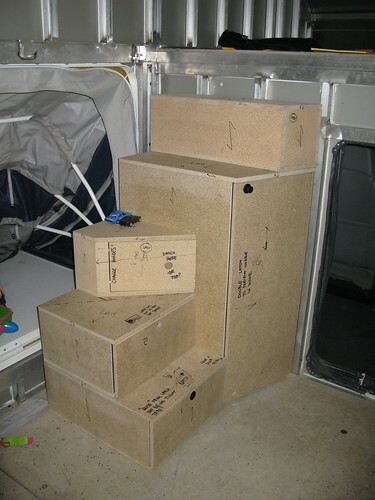 2 - The truck didn't have remote door locks, and having to reach up the 6ft to get to the lock switch every time you want to put the kids in the car was becoming a pain. The remote control for the Clifford allows me to connect 3 other relays as well, which I think we'll use for the camper door and window shutters. 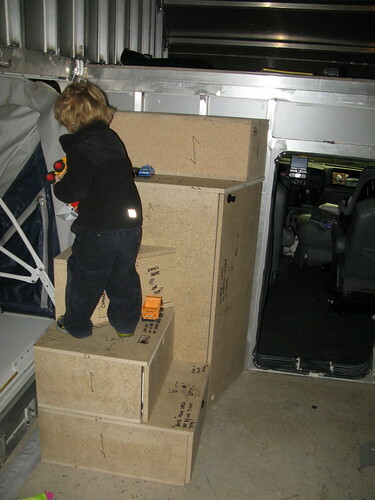 After several hours of Bob The Builder on the headrest screens, Kurt and I made it from Indianapolis back to Sturgis and met with Matt Sutter from Michiana Laminatedto review the final mock-up of the stairs unit. 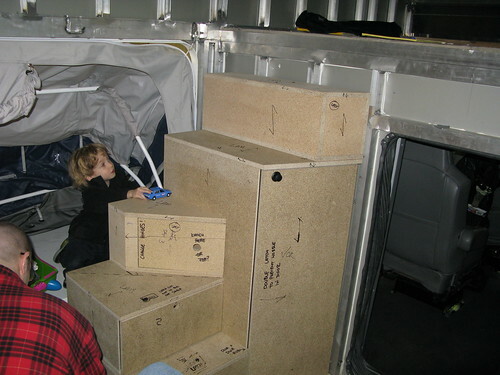 1 - It provides stairs up to the kids' "bedroom" over the cab. 3 - It is the entry way into the "spare bedroom" tent, with a slide out step on the rear side of the steps. 4 - As the first cabinet that we're building, it's setting the standards for all the other bamboo pieces including latch choices, hinges, door overlaps, etc. The final version will be built out of the PlyBoo material, with the Laminate floor surface. We signed it off, which is a major hurdle towards Matt & Michiana now building the rest of the bamboo kitchen cabinets, dinette, kids' beds, pantry, etc. Finally, last night we spun the four chairs in the cab around to face each other and had a "Production Meeting" in conference room "eco 1". It was pretty funny actually, and kind of sad to see how such a big truck feels very small when you squeeze four big guys into it facing each other. We set out the plan for the next few weeks... We're really pushing to get the truck 'ready enough' to make it to the Overland Expo in Arizona in April. I know that a lot of you are going to be there, and I'm really hoping that we can have the vehicle ready to bring there to get your first hand impressions and suggestions. - The water filtration system is on its way now - more info to come on that. - The solar panels should be going up on the roof in the next week or so, I'll upload some pics of those on the EcoRoamer website when they're installed. - I met with the guys at Pro-Air this week about the Diesel fired heating / air-conditioning / hot-water system. That should be taking shape soon and I'll post my plans for that.